Aqua Expeditions, which made its name in the river cruise market by offering luxury expedition cruises on South America's Amazon River, entered the Southeast Asian market in autumn 2014 with the launch of Aqua Mekong. Designed by Saigon-based architect David Hodkinson, Aqua Expeditions says it's the first five-star small luxury cruise ship to sail the Mekong River between the Mekong Delta in Vietnam and the Kingdom of Cambodia. The vessel oozes understated elegance, with polished wood floors and a neutral color scheme that incorporates local fabrics and materials. Aqua Mekong pampers its passengers in total comfort with an extraordinary 1:1 passenger-to-crew ratio and menu created by a Michelin-starred chef. For the ultimate cruise, there are two sets of interconnecting suites; each set of two rooms can be booked as one 644-square-foot stateroom with a private living room, bedroom and his-and-hers bathrooms. The vessel's 20 cabins, all 322 square feet with panoramic windows, are divided equally between the first and second decks. On each deck, there are four with balconies and six without. The balcony suites have outside daybeds, and non-balcony cabins have inside daybeds. All suites feature king-sized beds that can be converted into twins, flat-screen TVs, iPod docking stations, air-conditioning, rainwater showerheads and organic bathroom products. Aqua Expeditions appointed Australian-born Michelin-starred chef David Thompson to produce the menu for Aqua Mekong. David is Asia's top-ranked chef on the San Pellegrino World's 50 Best Restaurants' list. Meals are served in the dining room, aft on the second deck, and dishes, served on fine china and with crystal glassware, reflect local culinary traditions and feature seasonal ingredients. The observation deck boasts bow and stern outdoor lounges with sun loungers and a canopy, as well as an indoor lounge area and bar. The observation deck can also be used for private film screenings for up to 10 people, and the ship has a library of movies featuring the region, such as "The Scent of Green Papaya," "The Quiet American" and "Good Morning Vietnam." Other amenities include a library, shop and two spa treatment rooms, each with single and double massage beds. The vessel also has an onboard paramedic. Ten bicycles are provided free of charge for passengers who want to explore independently ashore. Aqua Mekong operates three-, four- and seven-night cruises embarking from Siem Reap, Phnom Penh and Ho Chi Minh City. Fares include all meals and drinks -- soft drinks, house wine and beer -- excursions and transfers to and from the vessel. International air travel is not included. 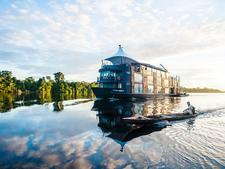 The 32-passenger Aria Amazon, which explores Peru's Pacaya Samiria Reserve, has the feel of a floating boutique hotel with spacious, air-conditioned suites with floor-to-ceiling windows.